These Monitor Stands Hold up to 200 Lbs. in Weight. These Rolling Kiosks Have Lockable Wheels. These Monitor Stands Come with a Shelf for Associated Electronics. These monitor stands, like LCD carts, are 51" tall and have an easy glide wheel system that is silent when rolling, and locks in place when a destination is reached. 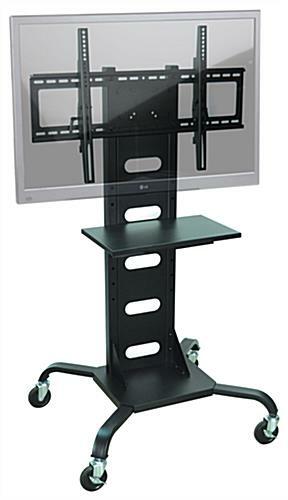 These multimedia fixtures, also known as classroom furniture feature a VESA bracket to accommodate a 37" to 60" plasma screen weighing no more than 200 lbs. 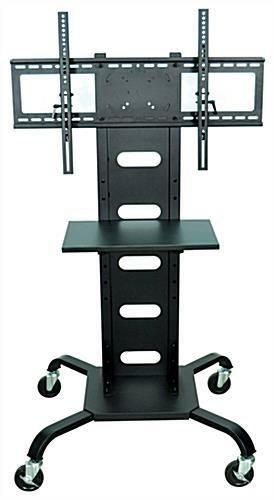 These monitor stands have a steel frame to keep the equipment stable. These kiosks for lectures feature a shelf that is 18-3/4"w x 11-3/4"d for associated AV accessories, with a perforated back panel to prevent electronic items from overheating. 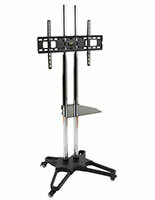 These monitor stands have a shelf that can adjust from 25" to 40" high in 2-1/2" increments. The merchandise arrives with all the hardware necessary for speedy assembly! Manufacturer model# WPSMS51. 31.0" x 51.0" x 28.0"